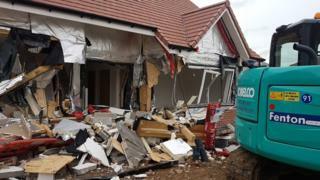 A builder who caused nearly £1m in damage when he wrecked five newly built houses with a digger has been jailed. Daniel Neagu, 31, filmed himself and whooped in delight as he destroyed the properties in a dispute over wages. The 31-year-old of Harrow, north-west London had admitted criminal damage to the homes in Buntingford, Hertfordshire, on 11 August. Sentencing Neagu to four years, Judge Stephen Warner said the "wanton vandalism" was a "pure act of revenge". The retirement homes - valued at between £425,000 and £475,000 - had to be fully rebuilt by McCarthy & Stone Retirement Living at a cost of nearly £1m. St Albans Crown Court heard former plant operator Neagu claimed his firm was owed £16,000 in unpaid wages by a subcontractor, Fenton, meaning he could not pay his team. Fentons had withheld the money because one of its vehicles, which was fitted with a tracker, was found to be in Neagu's native Romania. He said he would return it when he was paid, the court heard. Judge Warner said the footage of Neagu destroying the buildings while singing and whistling - was "truly shocking". "You were perfectly relaxed and not ashamed. This was planned, deliberate and wanton vandalism involving the destruction of other people's property undertaken by you as a pure act of revenge," he said. When neighbours called the police, Neagu told them: "They haven't paid me. I decided even if I got into trouble I did it for a reason... I wanted to give them a lesson." In police interviews he said he was "helpless, angry, disappointed and scared" because he did not have money to pay his staff, and claimed he and his family had been threatened. When he was charged, he said: "I did it because they owed me money and I thought it was more healthy for me to be inside rather than outside."